Arteriovenous fistula (AVF) nonmaturation is currently the Achilles heel of dialysis vascular access (1), with two large National Institutes of Health–funded studies showing that 60% of surgically created AVFs in the United States either undergo primary failure or require an intervention to be able to support dialysis (2,3). At a radiologic level, the main cause of AVF nonmaturation (where maturation is defined for the purpose of this editorial as an increase in flow and diameter that is sufficient to allow for successful dialysis), is a stenosis within the venous segment of the AVF (often in the perianastomotic region) (4). At a pathogenetic level, this stenosis seems to be caused by a combination of neointimal hyperplasia and an inadequate outward or positive remodeling. Most importantly, at a clinical level, AVF nonmaturation results in multiple endovascular and surgical interventions to try and facilitate maturation and also, results in a prolonged duration of tunneled dialysis catheter use with all its attendant complications of infection, thrombosis, and central vein stenosis. Both of the above result in a very significant morbidity, mortality, and economic cost (5). As a community, we, therefore, desperately need to develop effective predictors of AVF nonmaturation, which would allow us to move away from the one size fits all fistula first approach that we currently use to a more individualized, precision medicine paradigm for dialysis vascular access care. In this context, Shiu et al. (6) are to be congratulated on their article in this issue of the Clinical Journal of the American Society of Nephrology, which hypothesizes that the degree of medial fibrosis and/or the orientation of collagen fibers in arterial or venous samples collected at the time of AVF creation could potentially predict AVF nonmaturation. The biologic rationale underlying this hypothesis seemed to be sound in that they speculated that an increase in medial fibrosis, especially in combination with a nonparallel orientation of collagen fibers, would result in stiff vessels that would not be amenable to vascular dilation after AVF creation. In stark contrast to this original hypothesis, however, their reported results show just the opposite, with an increase in arterial (albeit not venous) medial fibrosis being associated with an increase in AVF maturation. In my mind, there are both positive and negative aspects to this finding. On the one hand, the availability of any predictor of AVF maturation (or nonmaturation) could have an important effect on both clinical practice and patient quality of life. Thus, patients at high risk of AVF nonmaturation on the basis of the degree of medial fibrosis could potentially go down alternative vascular access process of care pathways, such as the use of preemptive therapies that help to promote AVF maturation or arteriovenous graft placement. On the other hand, the use of a biologic predictor that is based on an invalid hypothesis (as in the current setting) clearly does not generate much confidence in this predictor (chance versus epiphenomenon). Although Shiu et al. (6) suggest potential mechanisms by which an increase in medial fibrosis could facilitate AVF maturation (such as increased endogenous nitric oxide production, which causes both collagen production, resulting in more medial fibrosis, and outward dilation), none of these potential pathways generate much enthusiasm for the future qualification of medial fibrosis as a biomarker for successful AVF maturation. Despite these findings, however, I believe that the article by Shiu et al. (6) has a number of important messages with regard to the future development of a pragmatic precision–based approach to dialysis vascular access dysfunction as a whole (not just AVF nonmaturation). These are listed below. The first is that we need a better understanding of the biology of dialysis vascular access dysfunction. An important message that emerges from the article by Shiu et al. (6) is that we may not currently know enough about the biology of AVF maturation. In particular, the presented data would suggest that we may need to move away from the use of histologic predictors as described by Shiu et al. (6) and instead, embrace the use of molecular signatures, which may have superior prediction capabilities. Thus, much as in the case of oncology, patients with similar clinical, demographic, and histologic characteristics may have diverse molecular signatures, with the latter having the greatest predictive value for AVF maturation. In this context, the combination of stored blood and tissue samples (together with extensive clinical and demographic data), such as those available from the Hemodialysis Fistula Maturation Consortium, together with the easy availability of next generation molecular technologies (RNA sequencing and epigenetics) could provide us with a unique opportunity develop a set of molecular predictors for AVF maturation. In addition, more experimental work in this area using animal models that replicate the clinical setting (including the presence of uremia) could allow for the discovery of new mechanistic pathways for AVF nonmaturation, which could then be used to develop both predictive markers and novel therapies for this clinical problem. The second message focuses on leveraging pragmatic strengths to develop a precision medicine approach for dialysis vascular access. 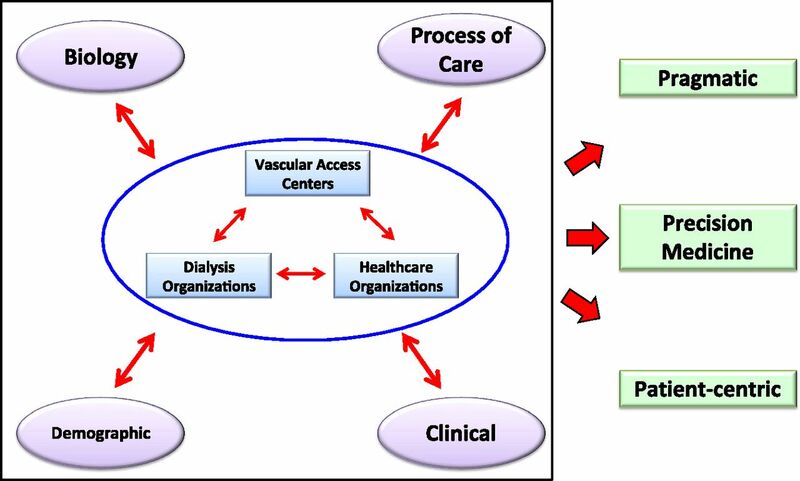 In this context, the current distribution of vascular access care between dialysis organizations, vascular access centers, and health care provider organizations allows us a unique opportunity to develop (through a pragmatic standard of care approach) (7) a set of real time vascular access data fields that could be easily collected through an integration of the electronic medical records of these three organizations. Such an approach could result in a future real time data registry for vascular access (with a biologic overlay as needed through the collection of blood and tissue samples), which could then be used to develop clinical, demographic, and biologic predictors that would allow for the individualization of vascular access care (a pragmatic, patient–centric, precision medicine approach for the future) (Figure 1). Developing a pragmatic, patient–centric, precision medicine approach to dialysis vascular access. Note how the pragmatic collection of centralized data within dialysis organizations, vascular access centers, and health care provider organizations could result in the development of clinical, demographic, biologic, and process of care predictors for arteriovenous fistula maturation. This would result in a patient–centric, precision medicine approach to vascular access dysfunction. In summary, therefore, although the study by Shiu et al. (6) does not directly identify predictors for AVF nonmaturation, it does, in my mind, begin a much needed conversation on the best way to develop clinical, demographic, and biologic predictors of AVF nonmaturation, while simultaneously leveraging the pragmatic strengths that are available within dialysis organizations, vascular access centers, and health care provider organizations. In addition, it is likely that the future availability of such predictive parameters for vascular access care will be critical for the financial viability of global payment systems, such as the ESRD seamless care organizations (8), particularly as health care moves from a volume- to a value-based system (9,10). Dr. Roy-Chaudhury is currently supported through NIH grants R01DK088777, R21 EB16737, R44DK100156, 5UL1TR000005, a sub contract on an NSF Engineering Research Center grant and a VA Merit Review I01BX002390. He is a consultant/advisory board member for W.L. Gore and Associates, Bard Peripheral Vascular, Medtronic, Cook Medical, Humacyte and TVA Medical. See related article, “Preoperative Vascular Medial Fibrosis and Arteriovenous Fistula Development,” on pages 1615–1623.